BEAST IN BLACK Unveil New Single "Die By The Blade"
Up and coming metallers BEAST IN BLACK will unleash their sophomore album From Hell With Love, next month on February 8, 2019 via Nuclear Blast Records. After posting a few album trailers giving the fans an insight into their creative process, the band has released the second single from their upcoming opus today. Watch the lyric video for "Die By The Blade" below. States Anton, ""Die By The Blade" is one of the Berserk manga related songs on the album and apart from its very straightforward song title, the lyrics deal with a deeper issue than it might seem at first glance. Music-wise it's a definite BEAST IN BLACK style heavy metal earworm and Yannis' powerful and emotional all-or-nothing type of performance deserves a special mention!" 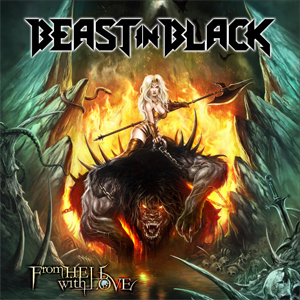 "Cry Out For A Hero"
The album was once again recorded in Anton's own Sound Request Studio, and true to the motto "Never change a winning team", the cover artwork was created by Roman Ismailov who worked on Berserker as well as the first record Kabanen wrote under the banner of BATTLE BEAST, Steel (2012). From Hell With Love delivers everything that made fans love Anton's work in the first place. A slew of fast-paced tracks like the opener "Cry Out For A Hero" and "Repentless", hymnic songs "Unlimited Sin" and "This Is War" and one of the band's specialties, mid-tempo smashers that only BEAST IN BLACK can deliver are back and represented on the new disc by the lead single "Sweet True Lies" and the album's title track. There's one thing that all of these tracks have in common - each and every song catches the listener with irresistible melodies, taking residence in the listener's mind from the moment they hear it.